Engelberg Switzerland is a haven for skiers, the name actually translates to Angel Mountain. Engelberg comprises two ski resorts – Titlis and Brunni, with a beautiful ski village at the base and an Igloo Village up on the slopes. Brunni is best for beginners and families while Mt Titlis offers spectacular glacier skiing and higher more challenging terrain. The Brunni Ski Region is the sunnier family oriented side of Engelberg. Klostermatte at the base offers a perfect area for beginners, with two lifts and a magic carpet, and ski school. Kids will enjoy Globis Winterland and Kinderland for youngsters. Globis is a toucan mascot very popular with Swiss children, making learning to ski fun as they follow Globis around the resort. Brunni has night skiing on Klostermatte slopes some weekends. The Brunni Tram takes you to a few fun sunny slopes at Ristis and a Poma to Schonegg. The Brunni side is also popular for sledging, winter wandering and parasail launching. Lunch on the sunny deck of Brunni Hut offers perfect views of Titlis Glacier, the sledders going by and the occasional parasails from Brunni’s slopes. Engelberg-Titlis ski area, on the other side of town, has three aspects and over 50 miles of slopes served by many modern lifts, with skiing from October into May on the Titlis Glacier. Engelberg Titlis is not just a ski mountain on a glacier, it’s also a high-elevation amusement park of snow and ice. 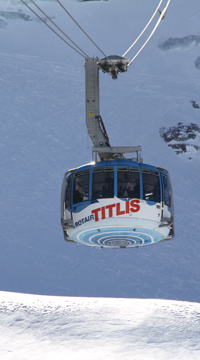 Many come from all over the world just to ride the cool lifts up Titilis, including the Titlis Rotair – the first rotating tram that spins a full 360 during its trip, and to see their first snow and ice at the summit. Asians and Indians are particularly drawn to this Disney on snow kind of attraction, that includes a Glacier Park where you can tour Glacier Caves or try the Titlis Cliff Walk – a long wiggly suspended bridge at 9,908′ with amazing photo ops. 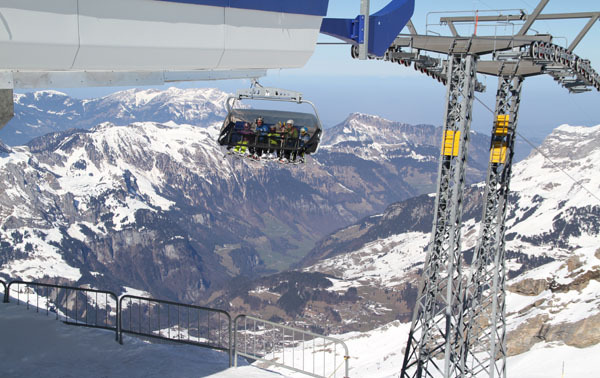 Mount Titlis is a ski playground at 10,000‘, the Ice Flyer chairlift provides riders a bird’s eye view over the beautiful sparkling Titlis Glacier, and serves a few well-pitched prepared trails as does the nearby T-Bar. Stand and Jochstock areas offer more interesting red and black groomed trails, plus some very challenging off piste terrain like the legendary Laub – a super long wide steep natural run. Kids will enjoy the Speed Check, Obstacle Park and Big Air Bar Jump at Jochpass. Engelberg Titlis is known for its off piste powder skiing and couloirs if you are looking for advanced high alpine adventure with a mountain guide. Ask about skiing Engelberg’s Big 5 to impress your guide, the longest ski run is 7.5 miles descending 6,500′ vertical. Wonderful chalet restaurants dot the ski slopes of Engleberg, including Skihutte Stand, Alpstubli and The Ritz at the base of the Laub run. On Lake Trubsee at mid mountain, there is an Igloo Village and a SnowXPark where you can drive electric motorbikes around a snow track, they have special smaller sleds for kids. Igloo village is also a “cool” place to stop, explore the IgluDorf and have lunch of Swiss Fondue. Aside from alpine skiing at Engelberg, there is cross-country, sledging (which is crazy Swiss sledding on wooden runner sleds down the mountainside), winter hiking and snowshoeing to enjoy the dramatic Swiss Alps scenery of the Engelberg valley. Engelberg village is charming, good sized with shops, restaurants and a magnificent Benedictine Monastery as the centerpiece of town. You can tour the impressive Church and the 12th century Monastery grounds and visit the Monks’ cheese-making store. Lodging in the ski village of Engelberg you have a choice of chalet apartments, to hotels like Ramada, Bellevue, and The Ski Lodge Engelberg which is modern, cozy and has bistro dining at Brasserie Konrad, and lively “happy hour” après ski all under one chalet roof, run by Swedes. Spend the night at 5,905′ in Engelberg’s Igloo Village, enjoy Swiss cheese fondue dinner, an evening snowshoe, and a soak in the steamy whirlpool, then sleep in the beautiful illuminated igloo with the heat of the Swedish woodstove before a homemade breakfast in the Alpstubli restaurant before you ski away. A family ski trip to Engelberg would be well paired with a stop in the nearby Haslital and Jungfrau Region. 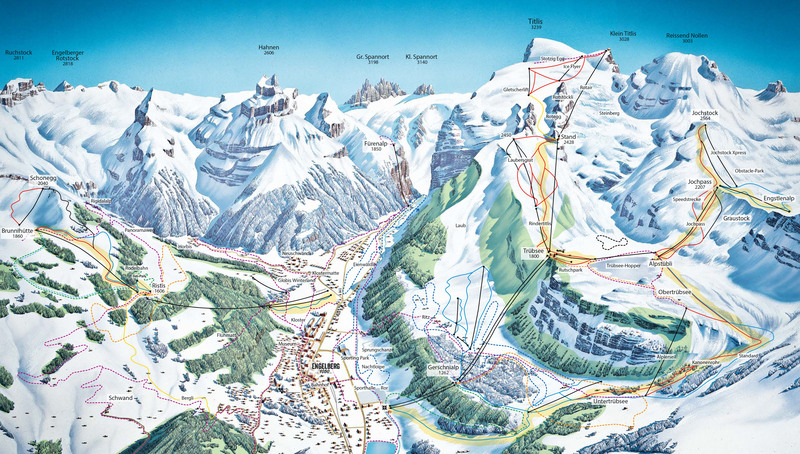 10,000′ highest summit, 6,500′ vertical, 25 lifts with gondolas and cable cars, over 50 miles of trails at two ski resorts -Titlis and Brunni. Fly into Zurich, take the Train 60 miles, approximately 2 hours, or an hour via car.